The 41-year-old considered as one of the best referees in the world leaves English Football to take up a role with the Saudi Arabian Football Federation. Clattenburg, who took charge of the FA Cup final, Champions League final, and the European Championship final in 2016, approached his PGMOL bosses before Christmas to ask to be released from his contract. 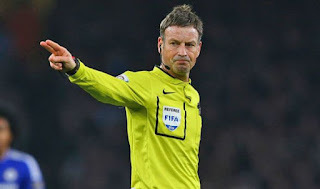 Clattenburg, who has been in the top-flight for the past 12 years will leave his role before the next round of Premier League fixtures, which start on February 25. He is understood to have grown tired of the level of scrutiny of officiating in the Premier League. "The Professional Game Match Officials Limited would like to wish Mark Clattenburg well as he prepares for his move to the Saudi Arabian Football Federation. "Since joining the PGMOL Select Group in 2004, Mark developed into one of our top officials, refereeing at the highest level and setting standards for others to follow. "His accomplishments are numerous and last season saw Mark achieve a memorable treble, on top of another consistently excellent season in the Premier League, as he officiated three major cup finals – the FA Cup final, the UEFA Champions League final and the UEFA Euro 2016 final. "Mark is a talented referee, he has been a great asset to the English game and hopefully an inspiration to those who want to get into refereeing at the grass roots of the game. "We understand this is an exciting opportunity for Mark as well as further underlining what high esteem English match officials are held throughout the world game." 0 Response to "Top Premier League Referee Mark Clattenburg Dumps England For Saudi Arabia"